With my dearest and oldest friend of nearly 30 years about to make yet another house-move, this comes as a gift to ensure he breathes on and on, forever!! …. or at least until the ripe old age of 96!! Breathing is the most important of all our bodily functions. Our bodies can go without food for several weeks, and water for several days, but it would only take three minutes without drawing breath before the average human suffered brain damage, and around 10 minutes before they died. The main exceptions to this are free divers who train themselves to hold their breath for extended periods of time – the record is just over 22 minutes. As much as I love snorkelling, this is too scary, even for me! Divers aside, too little oxygen leads to symptoms of dizziness, confusion, lack of co-ordination, headaches and, eventually, a condition known as hypoxaemia, i.e. an abnormally low concentration of oxygen in the blood, which means there is not enough of it to effectively nourish the cells, tissues and organs. Hypoxaemia can be acute, occurring suddenly because of an emergency situation like a blocked airway, or chronic, taking place over time due to an illness such as lung disease, asthma or even anaemia. Symptoms can include a change of skin colour, ranging from blue to bright red, plus confusion, a cough, a fast heart rate, shortness of breath and wheezing. As babies, we naturally take deep breaths from our abdomens, but as we age, life’s stresses can cause our natural fight or flight response to kick in. This causes us to take short, sharp breaths and, over time, we become used to breathing this way, permanently hyperventilating or over-breathing, which leads to a poor exchange of oxygen and carbon dioxide in the bloodstream. This deprives organs of proper blood flow, so causing fatigue, insomnia, panic attacks and depression. In fact, it may not surprise you to learn that over 80% of people in the western world, over-breathe! Plenty of people are poor breathers – my friend, a case in point – after smoking for most of his adult life, to have given up nearly 30 years ago may indeed have extended his life….it has, however, left an indelible mark in the form of chronic obstructive pulmonary disease (COPD), commonly known as emphysema or chronic bronchitis. After the air we inhale passes through the windpipe and bronchioles, it ends up in the millions of tiny sacs in the lungs, called alveoli. Here, gas exchange takes place, i.e. when oxygen is inhaled, it passes into the blood, and carbon dioxide passes out of the blood into the alveoli. The carbon dioxide we exhale is a waste product of energy production and the oxygen taken in is then used by the body. Breathing ‘badly’ shows up in various ways: breathing through the mouth, needing to take large breaths before talking, loud breathing during rest and, most notably, breathing through the upper chest rather than the diaphragm. 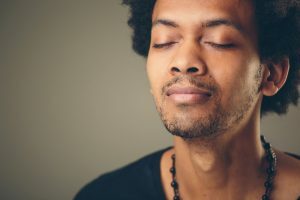 We can all learn to breathe properly by doing what we call, breathwork, a term used to describe therapies that use breathing exercises to improve mental and physical wellbeing. Yoga breathing and transformational breathwork can help to alleviate conditions such as asthma, so that diaphragmatic breathing becomes the norm. The simplest way to instantly improve how we breathe is to learn to use your diaphragm, the sheet-like muscle at the bottom of your chest cavity. To find your diaphragm, sit upright and place one hand on your abdomen, between your ribs. Place your other hand on your chest and, as you inhale and exhale slowly through your nose, ensure only the hand on your abdomen moves. It’s not that easy, but this is the correct way to breathe. Take 10 full breaths in and out, to clear the lungs and to pump your body with oxygen. Practise this exercise five times a day to improve the quality of your breathing and to help yourself breathe easy for the rest of your amazing and extended life!! Live Long & Prosper!